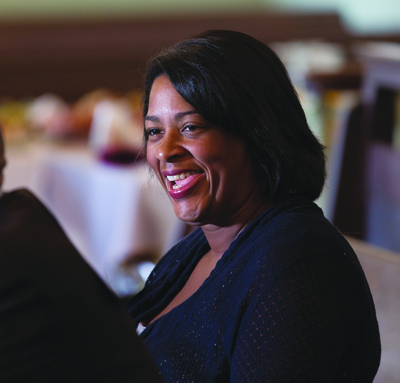 Every day, for more than three years, Dawn Porter ’88 agonized over leaving her job. Her comfortable position as a media executive was secure, replete with benefits and, as she wistfully reminisces now, a bountiful office-supply closet. So what finally motivated the former vice president of the legal department at A&E to forsake her position and stature? It made her grouchy. “I thought, ‘You could go on feeling crabby and unfulfilled, or you can try something else,’ ” Porter says. Porter, now three years into her documentary-filmmaking career, is already gaining a reputation in social-justice circles. Gideon’s Army, Porter’s first feature-length documentary, aired on HBO in July and garnered the Editing Award for U.S. Documentary at the Sundance Film Festival, where it premiered last year. The Georgetown Law graduate’s transition to filmmaker, however, came with some surprising setbacks, mainly an identity crisis (not to mention some serious sticker shock when buying her first office supplies). “I was always a lawyer and once I wasn’t, I felt titleless. I couldn’t even call myself a director,” Porter says of the time between leaving A&E and completing Gideon’s Army. Like any good Swarthmore grad, Porter did her research before transitioning careers: She used vacation time from work, taking self-funded trips to documentary-filmmaking conferences, always on the lookout for a good first project. In 2009, a friend introduced her to lawyer/activist Jonathan Rapping, whose long list of achievements and titles include president and founder of Gideon’s Promise, an organization helping public defenders with the scarcest resources in the South enhance their legal aid to the poor. Rapping invited Porter to one of his public-defender boot camps in Alabama. Thinking it might lead to something more, she hired a film crew to accompany her. Suddenly, she had a story that her conscience demanded be shared. Ahead of her were three years of constant travel from her Montclair, N.J., home—where she lives with her husband and two young sons—to Florida, Mississippi, and Georgia, filming the shockingly underpaid and profoundly overworked public defenders in action. Perhaps most challenging was Porter’s disillusionment with the country’s criminal-justice system. When discussing the plight of these public defenders and their clients, the urgency in Porter’s voice mounts as she paints a statistical landscape of the system. “Eighty percent of the 12 million people arrested each year in the criminal-justice system are poor enough to qualify for [representation by] a public defender. Ninety-five percent of those people plead guilty,” Porter says, indignation rising. Clients of public defenders who are too poor to make bail often choose to plead guilty rather than endure the lengthy stint in jail that accompanies a trial—even if they didn’t commit the alleged crimes, she explains. A guilty conviction comes with restrictions to food stamps, public housing, jobs, and student loans, causing people to break the law to survive, beginning the cycle anew. Delivering the McCabe Lecture on campus during Garnet Weekend in October, Porter delineated some bleak realities for incarcerated indigent persons in the South. When she asked the audience how many cases a public defender might be expected to manage, audience members responded five to 25. The actual number, 150 to 500 federal cases, elicited an audible gasp (misdemeanor caseloads are even bigger). Today, Porter spends almost as much time showing the movie as she did making it. Some of those screenings are with policymakers, who she hopes will support positive change for public defenders and their clients nationwide. As for Porter, the film has already changed her life—she’s finally calling herself a filmmaker, with two more documentaries set to air.